You will need a very dark sky to see the constellation Monoceros the Unicorn on these cold January nights. How can you find the Unicorn? 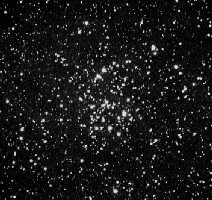 Focus in on the bright stars Betelgeuse, Sirius and Procyon. They make a triangle, sometimes called the Winter Triangle. Within this triangle of stars, hidden in between the many bright and glittering stars and constellations visible at this time of year, there is a constellation as elusive in our night sky as its namesake is in countless fairy tales. This is the constellation Monoceros the Unicorn. 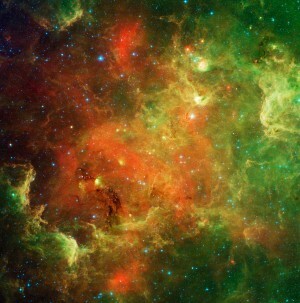 You will need a very dark sky to see it. 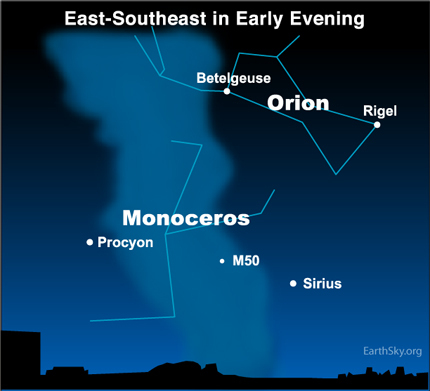 Like all of the night sky, the region of the heavens around Monoceros holds interest. The winter Milky Way runs through here, so it is a good place to scan with binoculars. Treat yourself to a visit with a mythical beast – Monoceros the Unicorn – in the winter sky. See it now, before the waxing moon takes the darkness out of the evening night sky!